U.S. lawmakers are making their third attempt in just over a month to tweak ICD-10 with new legislation. 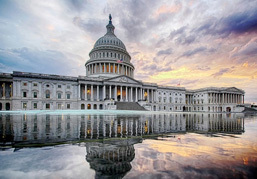 This time around, rather than attempting to kill or delay ICD-10 altogether, members of Congress have introduced a bill that would provide a two-year grace period for docs submitting claims. Proposed by Rep. Gary Palmer, R-Ala., along with 35 co-sponsors, Protecting Patients and Physicians Against Coding Act of 2015, or HR 2652, would give physicians and healthcare providers a little more leeway when submitting claims using the new ICD-10 classification, set to take effect this October. One of the concerns regarding ICD-10 put forth by healthcare stakeholders is around payments. As William Jefferson Terry Sr., MD, on behalf of the American Urological Association, said in a hearing this February, the reality is many physicians will lose payments for coding ICD-10 incorrectly come time for the transition. "Physicians have to have a guarantee that we're going to get paid if we don't code right," Terry said at hearing. "We provide a service, and you're not going to pay me if I code it wrong?" This bill, as Rep. Palmer described, would address this, as physicians and other healthcare providers would not be "penalized for errors, mistakes and malfunctions relation to the transition to such a code set," the bill reads. The legislation would also require a study to be conducted on how the ICD-10 transition has impacted the healthcare industry, specifically physicians practicing in rural areas. The transition from ICD-9 to 10 denotes a five-fold increase in coding, Palmer pointed out. This "threatens to hurt productivity, increase mistakes either from human or technological errors, and create confusion and difficulties as a result," he added in a press statement. "Current law could prevent them from being reimbursed by the government because of simple coding mistakes or systemic failures." This is particularly true, he added, with physicians who practice in rural hospitals or small medical practices, providers who "are less likely to have sufficient resources to fully prepare for the implementation of ICD-10." This is the third legislative attempt in just over a month to change or do away with ICD-10. Just last month, Rep. Diane Black, R-Tenn., introduced a bill that would provide certain safe harbors for submitted claims and also require the U.S. Dept. of Health and Human Services to provide a “transparent testing to assess the transition" of ICD-10. Back in April, lawmakers, led by Rep. Ted Poe, R-Texas, introduced a bill that would entirely prohibit HHS from implementing and enforcing ICD-10 altogether.